I have a collection of crafting tools that take up a fair amount of desktop space. I don’t want them hidden away, if they aren’t out in plain sight chances are they will go unused. When building my new craft room I knew I would need a workbench for them, in my old craft space they were on a small table, but they were crammed together, it had no storage space and it was always cluttered. 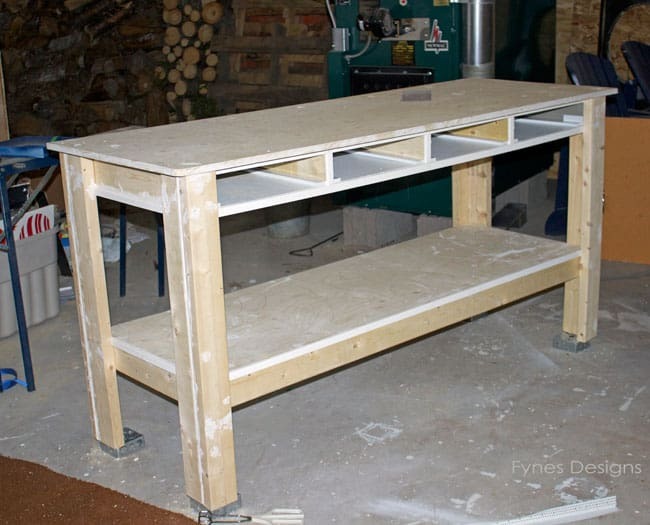 On one of my frequent Pinterest adventures I came across this plan for a Simple Workbench that I knew had potential. The workbench plans had all the components I was looking for. It boasted to last for decades, be inexpensive (mine rang in at about$50, but a few supplies were on hand), and can be built by a novice handyman. Perfect, except for the fact it was clearly designed for working on a motor and storing greasy tools it wasn’t very cute. I pulled out some left over paint, found a few boxes for the shelves, and got an assortment of cute drawer pulls and boring table turned cute craft table. Here is what it looks like before the drawers and coat of paint. I used crack fill to fill the screw holes and gaps from the 2×4’s to try to make it a bit more like an attractive piece of furniture. The storage crates cost me $5 at a thrift shop. The two apple boxes I got from my aunt, one of the wire baskets is from an old freezer. I chose an eclectic mix of drawer pulls from Lee Valley. Together they cost less than $8. I created paper stencils with my cricut for the numbers and painted them with chalkboard paint. When dried I sanded them down until I thought it looked vintage. I am eager to get the crates filled with goodies and the tools in their home. What do you think? 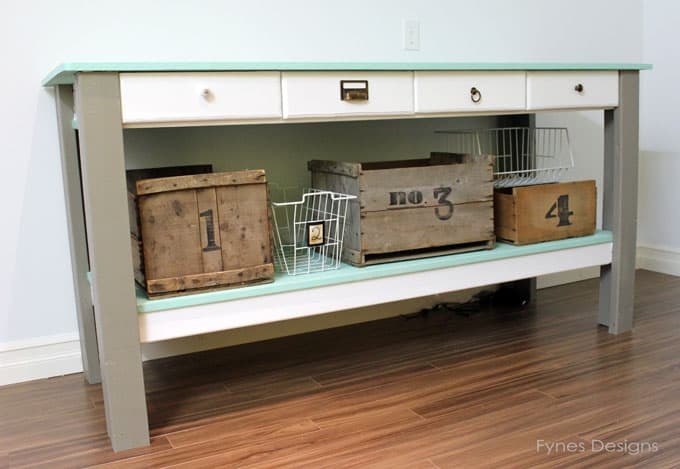 Do you have a special area to store your larger crafting tools? Thanks you to everyone who joined me for my Blogiversary. The winner of the three spools of May Arts Ribbon is ROSALYND KELLY who says “Congrats on your blogiversary! Mmmm, cake…I like them all…but my favourite is carrot cake“. Now that is my kinda lady, reading all your comments really makes me want to eat obscene amounts of cake! Rosalynd Please inbox me on FB and well get you geared up! Wow, I’m impressed every time! What a cool idea. I like how everything is so nicely organized and looks so pretty too. I’m visiting you today from Project Inspired. I hope you get a chance to stop by my blog and leave a comment, too! This is adorable and such a great workspace! LOVE the mint green color you used for the top! Wow! So cute and functional… love the mismatched handles, what a great unique touch. Visiting from Give Me the Goods Monday. Wow! I love that desk! 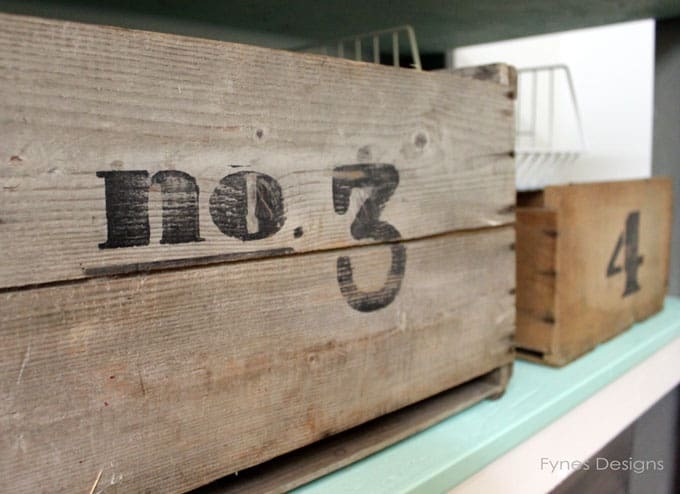 The crates are my favourite, I have a few like that that I keep my hair stuff and make up in. If I had the room for a desk this would be perfect. Will you get sick of me if just come here every week and tell you how talented you are? Not at all, I will just have a huge head the next time you see me… beware! I love the storage crates – great find! I LOVE the way it turned out! Thanks for sharing it at Monday Funday! I’m in total looooove with this gorgeous workbench – when do you think you could drop it by so I can use it in MY studio? I’m so very impressed!! Love this! 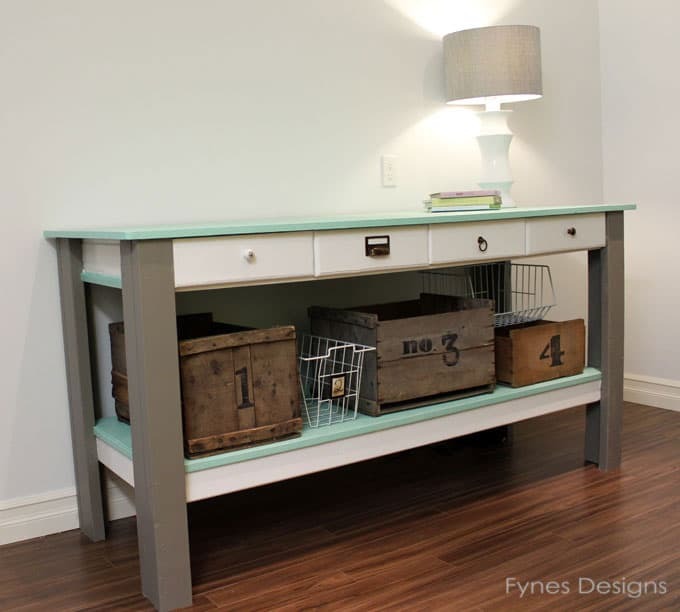 Love the color, love the knobs, love the storage underneath! Keeping this in mind for when I finally finish my craft room! Have a great weekend! Thanks Susan, have yourself a great (maybe crafty) weekend! Love the blog and this repurposing of this workbench is wonderful. Great job!! 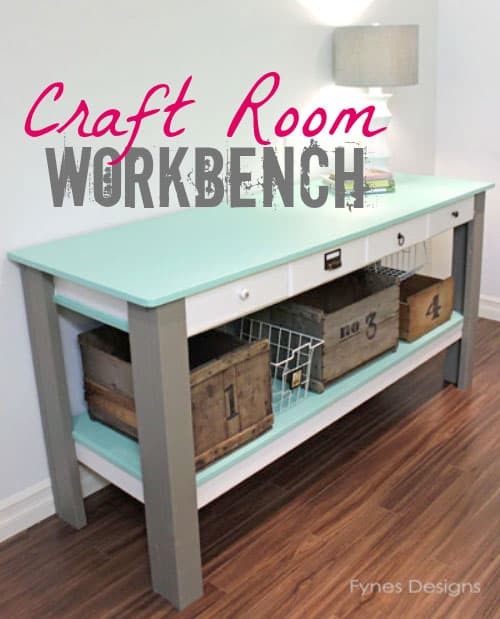 Such a great craft room desk! I’m featuring it in the PoPP Spotlight this week. Thanks for linking up. Love this bench! The style, color, everything about it. I am trying to figure out how you were able to make it so inexpensive? We just came home from Lowes and priced all the materials including knobs using the materials list via the link provided. NOT including paint, it’s already over $225.00. Did you do something different or is there a cheaper place to buy lumber? Hi Amy, To be honest it was so long ago, we did use some scraps we had on hand and I hunted around for cheap handles. I remember hubby telling me if I didn’t do the drawers it would have been cheaper and less work. Perhaps putting baskets in the holes would cut out a bit of cost. Maybe shop around for the best lumber price. Good luck! Thanks for sharing your wonderful, creative ideas. Could you post about your neat desk you have in your craft area? Thanks Cara! I used to have a post about it, but it was very dated. It is basically a shelf on one end with a bank of drawers from the Home Depot on the other. The top is a full sheet of plywood with arborite glued down. It was inexpensive but has served me very well! This turned out so great! I love the eclectic crates and pulls. Visiting you by way of Two uses Tuesday! Nice job on your craft table. Love , Love the baskets. What a cute little table! 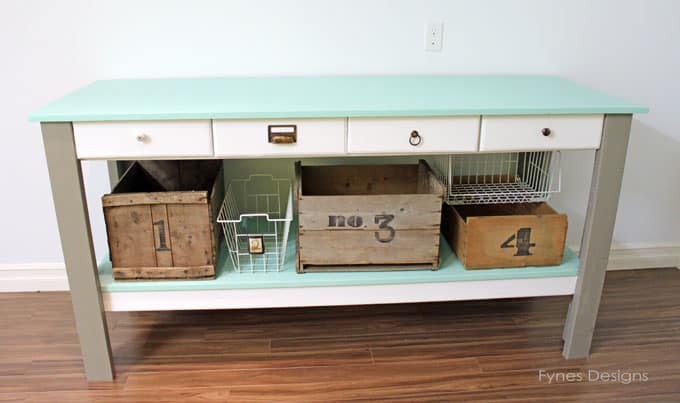 I have an entry table that is laid out similar to that one and I love the idea of making it into a craft storage… Thanks for sharing! I love that idea! I am in the midst of redoing my craft room….hmm. I love the rustic bins underneath the bench. This turned out looking really good. Love this friend! It’s so pretty! What an awesome project! 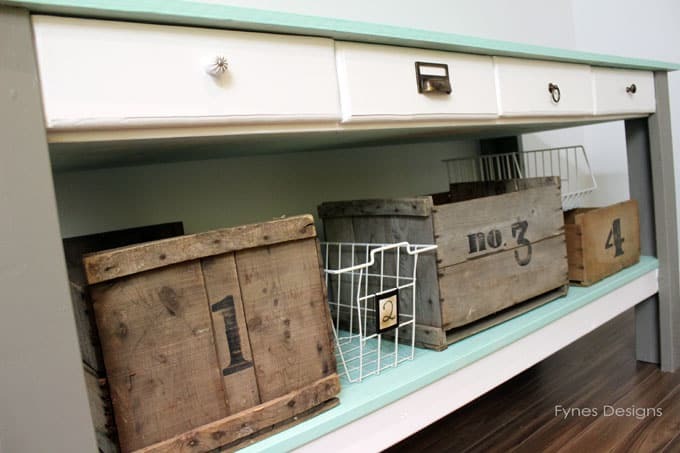 I love how you painted it, and those crates are fantastic! I love this! You would never know the before and after are the same bench! The color is beautiful and I love all the storage. Thanks for linking up to The Creative Exchange. We are featuring your project this week! I adore this. Love the colors and overall design! Very inspiring!! this information is good and creative.